I chose that title because Strawberry thinks “Hoover” has negative connotations when applied to our son. At dinner tonight, we got a tiny glimpse into Curly’s teenage years of eating us out of house and home. He ate a turkey meatball, noodles, green beans, puffs, and 2 ounces of whole milk in the span of 10 minutes. Half an hour later, after his bath, he downed a full 6 ounces of formula. It’s right on time, too. As we approach the one year mark, we have begun to think on weaning him off of bottles and formula and transitioning him to getting most of his calories and nutrition from a solid diet, supplemented by whole milk. We are lucky in that at this point he’s pretty much eaten whatever we put in front of him. 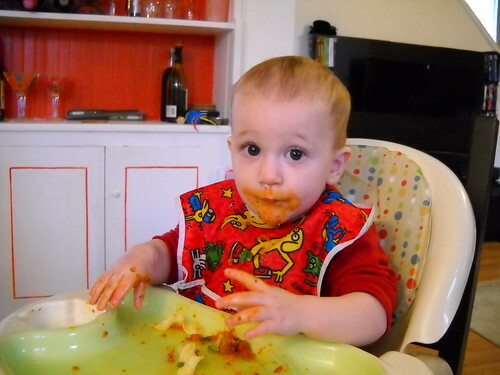 The 3 small meals we send to daycare each day are devoured, according to his care provider. Starting next week we’ll be increasing the portion sizes and asking her to make his bottles smaller. We sent a sippy cup for water to be offered along with meals a few weeks ago, but he’s not great with it. At home, he much prefers to drink either water or milk from a straw in an open cup held by one of us. He’s used the straw sippy before, but doesn’t love it. We’ll keep trying and he’ll get it soon, especially when bottles are no longer in the picture. The plan is for the day care bottles to go first. They’re pros, let them deal with the resulting tantrums. Then the evening bottle will go, replaced with more food and milk at the evening meal and perhaps a sippy with the pre-bedtime cuddle. The morning bottle will be the last to go, but we hope to be bottle free by 14 months. If anyone has advice to offer on this plan, feel free. Posted on March 23, 2010 by strawberry | Enter your password to view comments. It’s Spring!! There’s nothing quite like a few days of warm weather and sunshine and blooming flowers to brighten the mood. 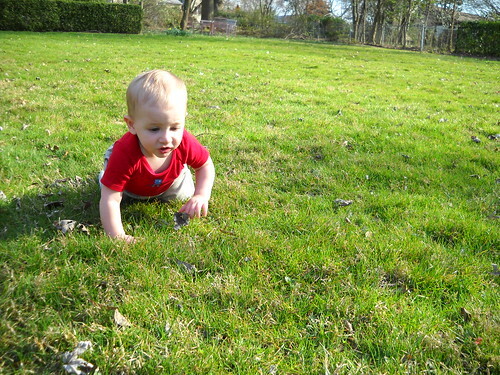 Curly got to try out crawling on grass for the first time. He wasn’t terribly thrilled with the texture, in fact, he made a face similar to the one he made when he crawled in the snow. But he did like having nearly limitless freedom, and was content to crawl after Hazel (the chihuahua) for as long as we’d let him. Sidenote: how do we get grass stains out of the knees of his little khakis? Curly was all better by this past weekend. It was just one of those weird things- a fever lasting 3 days and then back to normal. Not without freaking us out first, but we’re glad it wasn’t as horrible as The Roseola or as long-lasting as The RSV. We’re going on a little Spring Break vacation this Friday through Monday so fingers crossed that we all stay healthy for it. One of the things that Curly has learned to do lately is putting objects inside other objects. Like stackable blocks or the shapes into the shape sorter box (but not via the lid…the lid is removed, chewed on, and then tossed to the side). This morning, I was finishing getting dressed when Curly picked up Nutella’s house slippers one at a time, and proceeded to drop them into the bedroom trash pail. It was absolutely hilarious to me (probably because they weren’t MY slippers), but of course, it dawned on me that we’re probably going to find all sorts of unexplained objects inside other objects and things being experimentally thrown out now. Hmm. Curly also seems to be working on teeth #7 and #8, the bottom lateral incisors. He continues to clap at everything and very recently has begun to mimic us when we “sing”…which basically means we open our mouths wide and sing one drawn-out note. He will usually also sing a drawn out note in response, though he’s still working on his pitch. Finally, now that the weather is getting marvelously warmer, we are happily purchasing his spring/summer wardrobe. Nutella bought something like 10 new short-sleeved onesies, and I’ve been bidding on (and sometimes winning) rompers on e-bay because they’re not as easy to find in stores. I think it’s safe to say I have a slight addiction to bidding on baby clothes on ebay now, just as I have an obsession with dressing Curly up in his new clothes. However, with the purchase of many new things has come a purge of the old things. I can’t believe how tiny some of them are! Anyway, we think it’s high time for another Vermillion baby clothing contest, so look for that entry in the next day or two. Well, we had a few good weeks there. But this week has brought a high fever and a little bit of nasal congestion, so Curly has stayed home from daycare the last two days. He’s not really showing any other symptoms, and the fevers are responding well to ibuprofin. He’s sleepier than usual (as if that were possible) and a quick trip to the pediatrician gave him a diagnosis of: a virus. Hopefully he’ll be better after this weekend. On a lighter note, we thought it might be a good time to share one of the crazy things that parenthood has done to us- hallucinations. Mine are primarily auditory, whereas Strawberry’s are visual/physical. Starting from the very first night we had Curly home, I’ve been hearing him cry or scream sometimes when he’s completely silent. I’m certain this was exacerbated by sleep deprivation and hormones early on, but I can’t really blame it on that now. It can wake me from a deep sleep, but I’ve learned not to trust my ears. When we are downstairs and he’s in his bedroom, I can double check the lights on the baby monitor (we keep it silent) and Strawberry will catch me doing it and reassure me. When we’re upstairs asleep, I sometimes get out of bed and stand at his door to make sure he’s not crying. Meanwhile, starting very early after his birth and lasting a few weeks, Strawberry would have occasional nightly episodes where she was frantic that Curly was in our bed and suffocating in the blankets. I would wake up to her throwing back the covers and patting the bed (and me) looking for the baby while only half awake. This is especially odd because we never had him in the bed with us, ever. He was in the pack n’ play bassinet for the first 3 weeks and then in his crib. There were 4 or 5 episodes like this which subsided. But just two nights ago, I was startled from a deep sleep when Strawberry smacked me repeatedly on the chest. Apparently her dream state had convinced her that Curlywas choking so she thought she was smacking him on the back. Parenthood has obviously turned us into paranoid psychopaths. Anyone else experience similar craziness? 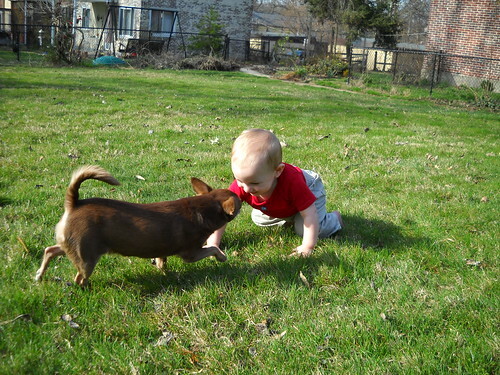 The highlight of our weekend was a play date with W over at Creating Motherhood. W and Curly are very close in age so it was totally cute seeing them both in action, from sharing toys to eating together to crawling everywhere and climbing over one another. We all had a lovely lunch and also took the boys to the swings. Oh, and to celebrate the occasion, Nutella made, for the first time, nutella cupcakes with strawberry frosting. They were delish, and we replaced our blog header photo with her creation. Not the kind of cupcakes our Cupcake will get for his first birthday, but there’s definitely something in the works for him.